I’ve had this Dri Sweat cap for a good while and never used it. I started doing the Insanity Workout almost two weeks ago and I’ve always used a bandana to wrap my head when I’m working out. 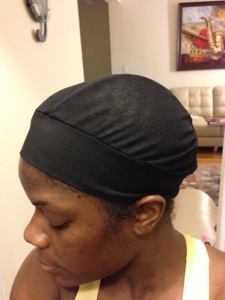 First, to absorb the sweat and secondly to hold my edges down until my hair dries. Although my hair is natural, I don’t generally wear it curly, so having my edges behave is important to me. The other day I randomly picked up my Dri Sweat cap and used it. I didn’t think anything of it until I took the cap off. It was SOAKING WET! I always sweat a lot in my head, but my head didn’t really feel wet like it usually does, which is what caused such a surprise when I took the cap off. I also noticed that my edges didn’t curl up as soon as I took the cap off. It was a little weird for me because I’m used to a sopping wet head when I’m done working out. I am now a believer in the Dri Sweat cap! It has a smooth band to hold down your edges and a mesh upper portion to allow your head to breathe. There’s even a hole in the back for your ponytail! It’s very inexpensive (Probably less than $5) and can be purchased at Target or Walgreens. See here. Go get one and workout for your health!